Stock # P17069, 3-phase 4-pole AC induction motor, Automatic, 44983 mi. 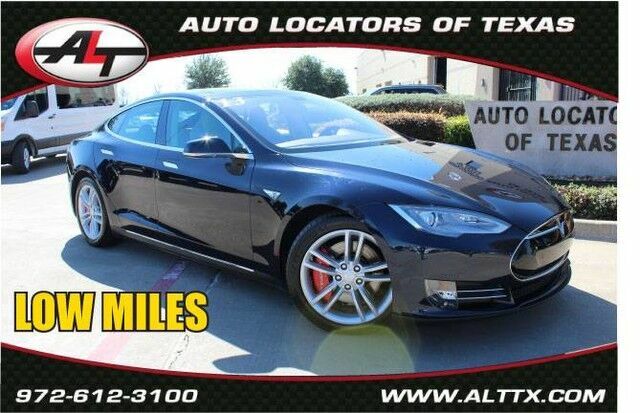 Just listed 2013 TESLA PERFORMANCE with ONLY 44,000 MILES! Buy this NON SMOKER with confidence since this TESLA is a CARFAX CERTIFIED vehicle. Sporty dark blue metallic exterior with gray LEATHER interior. Never get lost with your factory in dash GPS NAVIGATION unit. POWER PANORAMIC SUNROOF for those perfect summer nights and HEATED SEATS for those cold winter mornings. Loaded with upgraded stereo, alloy rims, keyless start, steering wheel controls, keyless entry with alarm and freezing cold AC. Rear back up camera and Bluetooth for your safety. Just serviced and ready to go! DID WE MENTION ONLY 44,000 MILES! STILL UNDER TESLA WARRANTY! Drive in luxury and style with all the bells and whistles. This LOADED TESLA is wholesale priced below book so do not wait. It will not last! Do you want your next car buying experience to be an enjoyable and a memorable one? After 20 years in business, we've streamlined the buying process to be completely hassle and stress free. Why wait? We can have you in and out in as little as 45 minutes from the time you step into the dealership to the time you drive away in your new vehicle. Our customers great reviews have a common theme, great prices, quality vehicles and an efficient no hassle environment. Just look on Yelp and Google to read what our 10,000 plus happy customers are saying about Auto Locators of Texas! Do you want your next car buying experience to be an enjoyable and a memorable one? After 20 years in business, we've streamlined the buying process to be completely hassle and stress free. Why wait? We can have you in and out in as little as 45 minutes from the time you step into the dealership to the time you drive away in your new vehicle. Our customers great reviews have a common theme, great prices, quality vehicles and an efficient no hassle environment. Just look on Yelp and Google to read what our 10,000 plus happy customers are saying about Auto Locators of Texas! Auto Locators of Texas has been in business for over 20 years, and we pride ourselves on our friendly, no-pressure approach to selling vehicles. We offer a wide selection of the highest quality used cars, trucks, and SUV's. Our finance department works hard to find every customer the best deal. Trade-ins are always welcome so we can answer your question of "what is my trade worth". We offer a wide variety of services from detailing, ding repair, body shop, service, and extended service plans. Call us today or check out more of our awesome selection at our website: http://www.alttx.com.